What will Pre-Calc﻿ulus Teacher Packages include? For reviewing at home, your students can have either the iBook (Pre- Calculus and SAT Interactive Lectures) for the iPad or Mac, or Kindle version (Pre-Calculus and SAT Lecture Notes) for any compatible Computer or Tablet, or the paperback version of the same book that includes the printouts of the entire lectures slides. 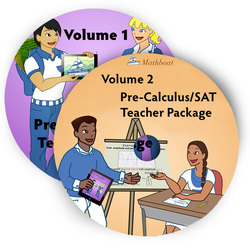 The Pre- Calculus lesson plans/pacing guide are very important for students’ success on SAT tests and their preparation for the rigorous Calculus curriculum. I spread out time exactly the way that works best, in my experience, for every topic to be covered, understood, and reviewed. + Worksheets (for every chapter) are designed for review before the chapter tests. Detailed step-by step solutions(in PDF format) are included. Why is ﻿SAT in ﻿the title? Because these lectures and worksheets will help tremendously with SAT preparation. Solving a Multiple-Choice problems from the SAT book only helps if students know the material really well, and the only thing they need to do is to practice. From my experiences, I know that students first need to learn the material well, and then start practicing from the prep book. I am really liking the level my precalculus students are at using the Mathboat materials. Thanks for being willing to share your hard work!! “From studious memorization techniques to funny, attention grabbing pictures... I learned through examples and proofs to know a lot of the concepts of PreCalculus. The memorization techniques helped me a lot ... Basically, it's AWESOME!” – B.W.